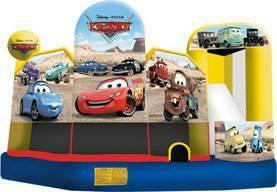 This Cars 5-in-1 combo bounce house is the largest in Carburetor County! Kids can pretend to race with Lighting McQueen, Mater and The King in this ultimate bounce house with five different fun-filled activities to entertain. Digital artwork features all of the cars at the race for the Piston Cup, including Fillmore, Lizzie, and Sarge posing above the racing-fast slide.